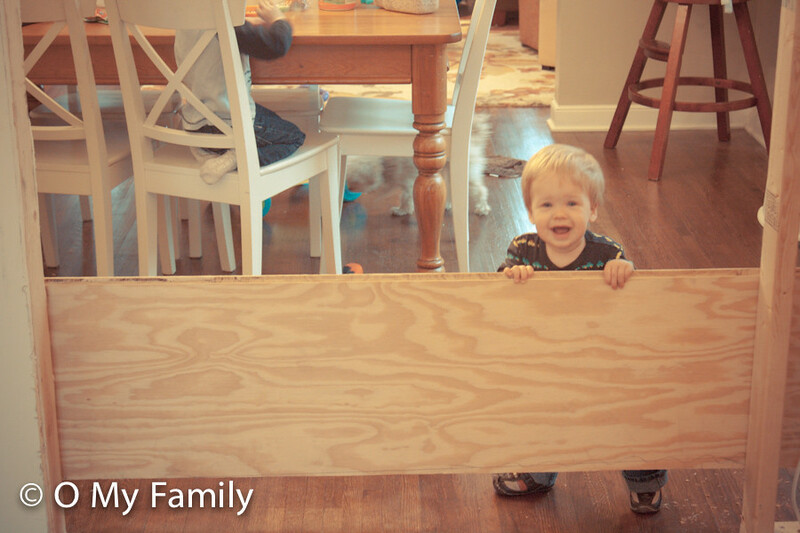 Posted by AllisonO & filed under House Projects, Kitchen Remodel, Our House. And by here I mean here, not here as in my house because O boy would that be far from the truth. No, here here there has been the constant sound of sheetrock saws cutting holes in ceilings for recessed lighting and in walls for outlets. There has been a pretty regular hum of a shop vac catching sawdust and the like. 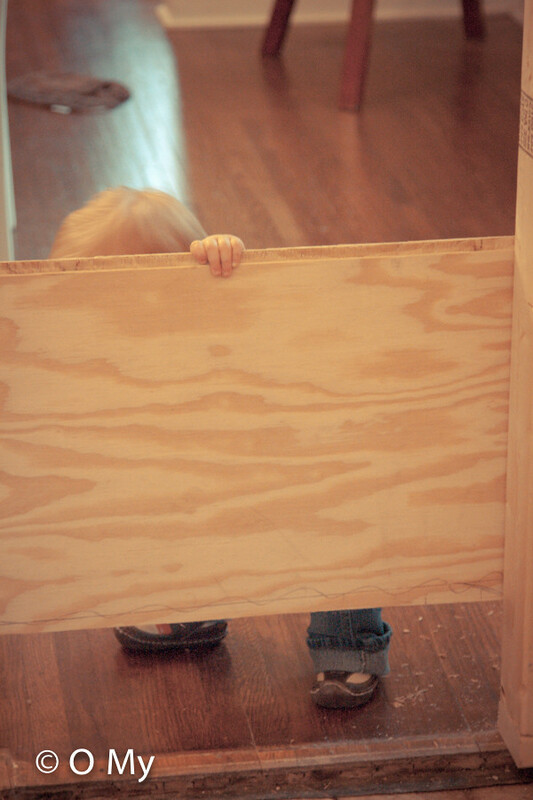 There’s been the pounding of 2x4s being framed in, moving walls around to just where we want them. And shhhh. Did you hear that? If you listen closely, you can hear the soft whimper of a mama who doesn’t have a working stove or oven and is serving her family meals on paper plates. My fridge is plugged into an extension cord, my range is completely non-functional and has served only as storage for the pots and pans for which I now have zero use, and there is a piece of plywood screwed to my dining room wall. Have you heard the expression that the kitchen is the heart of a home? Well if that’s true, our heart is currently laying out on the operating table and oooo, boy is it painful. Having the kitchen in a complete state of upheaval makes me care O, about thismuch about how the rest of the house looks. If I am eating off of paper plates from birthday parties past, am I to give a hoot that my dining room table is a veritable dumping ground? And if there is a constant, constant layer of fine plaster dust coating my floors, do you think I’m going to bother to sweep up those cheerios? Not a chance. It’s always at this point in a project that things start to drag for me. Demolition? Great, hand me a sledge hammer. Installing floors? Perfect, I’ll lay the pieces, you use the nail gun. But electrical? Meh. I usually do end up wiring some outlet boxes or helping DanO fish wire through the joists to the can lights, but even then it’s 4 seconds of helping for every 20 minutes of work. And the visual impact of wiring electrical compared to, you know, knocking out walls is very minimal. Thankfully, I have found a way to be useful during all this wire running. I sit in the kitchen (being supportive to DanO with my presence, obviously) on my laptop looking up things on craigslist. It’s true. We got our wood flooring on craigslist, I am watching appliance listings with an eagle eye, and we plan to list any cabinets we don’t re-use on there as well. O, did I mention? Instead of choosing a tile and laying it in the whole area, we are continuing our original wood floors – interweaving unfinished identical wood and sanding/staining it all to match so that it’s one continuous flooring throughout- and then the mudroom will be tiled. This will look awesome, but will be about 800% more work than the original plan of tiling the whole space. So where are we and what’s left to do (because I’m sure y’all like itemized project lists as much as I do)? We have already: demolished the interior of the formerly 3 season porch, insulated it, raised the floor to match the rest of the house, installed new windows and a new door, removed 4 layers of flooring in the kitchen, removed the west wall’s cabinets and appliances, removed the overhead east wall’s cabinets complete with soffit, wired all of the outlets, hung all of the recessed lights, wired them, moved the natural gas line to where the stove will now go, framed up a wall over an old doorway, widened the doorway into the dining room (will be french glass doors). lay down and take a nap*. * Actually, no napping will be allowed on our parts until the backyard, patio, and garage are also completely remodeled/re-landscaped. That’s up next. Yes, the crock pot. This project has made my crock a necessary (evil) part of my life. Problem is: chicken gets SO DRY in the crock, and most of the slow-cook recipes that I know we like include ground beef… which I’m supposed to brown the first. Humph. Oh, I know. I’ve learned (the hard way) that chicken cooks in the crock pot way faster than most recipes call for – especially if the crock pot isn’t very full. If I put it in for 8 hours on low, it’s always way too dry. I’d try 4-6 hours on low or 1.5-2 on high. Make soups! Baked potato soup, chicken tortilla soup or even a shredded beef roast all are one crock meals! Are you doing the backyard this summer too? Because wow. Yes. The plan is backyard this summer, too. 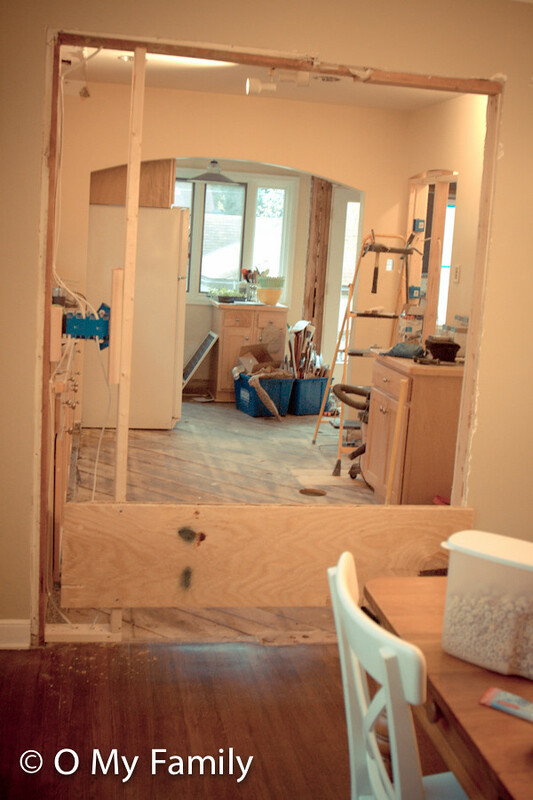 By the grace of God we hope to wrap up the kitchen before the longest day of the year (June 21) and use the remaining evening light this summer to overhaul the outside which… it’s funny how this works… sounds like a DREAM compared to not having a kitchen. You guys are so amazing. So handy! Can’t wait to see the finished kitchen. Oh, I feel you…maybe not to to the exact same extent as we’ve yet to rip up our kitchen, but we are also do-it-yourselfers. And I totally get the excitement of a new project, and then the project fatigue sets in. We just finished a new covered pavilion/deck at the end of the pool, and we will love it this summer! But mid-way through, when all of our free-time was devoted to the project, it gets wearisome. But now that it’s done, it’s great! And your new project sounds like it will be amazing when it’s all done! I do hope you’re planning a before/after post when it’s all done! Oh my. What a project! Hang in there! I love when you guys remodel! I hope you’re not one of those legit crazy people who redo their whole friggin houses, only to sell it. Good luck, you are an ambitious family. LOL. Well, that’s not the plan right now, that’s for sure. Although, I can’t say we’re not legit crazy. 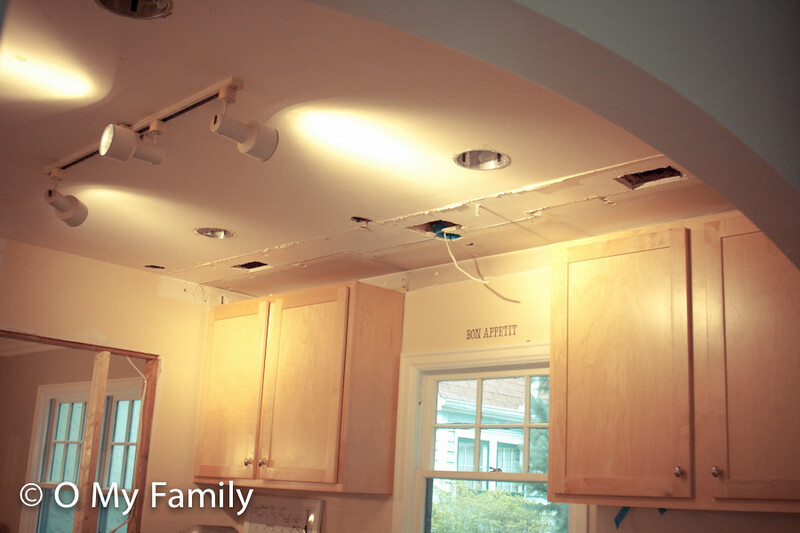 I give you LOTS of credit…..there is no way I would handle the craziness of a remodel. Again….lots of credit from me. I have just started reading your blog and am really enjoying it. I love hearing about the boys and the weightloss. I have missed your posts :( but I look forward to pictures! I am pretty much GIDDY over your floors. OH THE FLOORS. Lovey love love. Well good, because after more blood sweat and tears where will be MOAR FLOARS! Oh boy! Ha! Couldn’t resist! We used our electric skillet in the bathroom when our kitchen was being remodeled. Wasn’t fun to clean, so handy hubby would take it outside and wash it the best he could with the hose. If he wanted something tasty, he would help clean! Good luck and your family is adorable! I completely understand. We moved into a home that had been stripped and are slowly making it ours. I’m so thankful we don’t have the demo tho. Not sure I could handle that mess! Hang in there-my new kitchen is so amazing!